Joint providership is when two organizations, an ACCME accredited provider and a non-ACCME accredited provider jointly develop and implement a CME activity. The accredited provider (CME Outfitters) must take responsibility for a CME activity when it is presented in cooperation with a non-accredited institution or organization. An ACCME defined commercial interest cannot take the role of the non-accredited entity in a joint providership relationship. What are the fees to become a joint provider with CME Outfitters? CME Outfitters personalizes every proposal for each client based on their needs. Please contact Whitney Faler, Director of Accreditation, to discuss your educational activities and the services you need. I've seen CME providers charge a per participant fee and it's difficult to know exactly how many will attend my meeting to know my final cost. Does CME Outfitters charge fees like this? No! Unlike other providers, CME Outfitters does not charge a per participant fee. You will not see an additional bill if you have higher attendance than expected. We’ll be cheering for your success, not charging you for it. 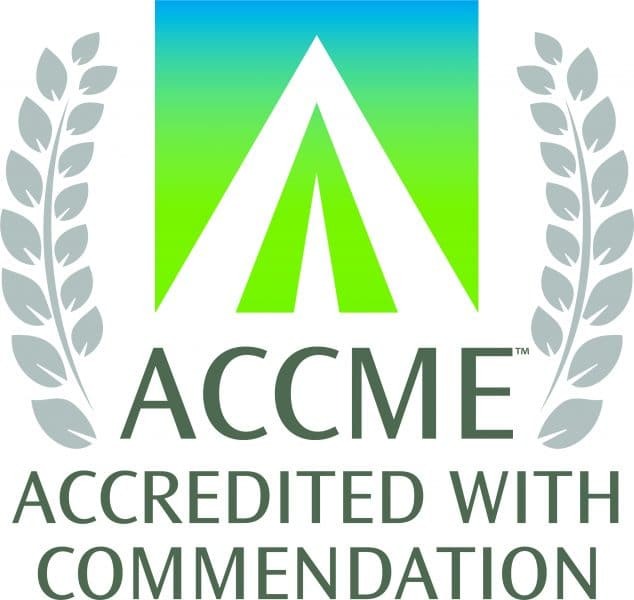 The Accreditation Council for Continuing Medical Education (ACCME) is the organization that establishes the standards for the accreditation of all providers of CME activities in the US. What types of activities qualify for CME/CE certification? What credit types does CME Outfitters offer? How are hours of credit calculated? Per the AMA for physician credit: 60 minutes equals one (1) hour of Category 1 credit. Credits can be divided into fifteen (15) minute increments (.25, .50, .75). Credit is rounded to the nearest 15-minute increment. Nursing contact hours are calculated in 30-minute increments and must be at least one (1) hour to qualify for credits. This means an activity can be 90 minutes (earning 1.5 credits) but not 30 minutes long. Can non-US licensed physicians be awarded AMA PRA Category 1 Credit™? Yes! AMA PRA Category 1 CreditTM may be awarded to any physician (defined by the AMA as MDs, DOs, or international physicians with equivalent degrees from other countries). The requirements for awarding AMA PRA Category 1 CreditTM to US and non-US licensed physicians are the same. Can non-physicians be awarded AMA PRA Category 1 Credit™? No. Non-physician healthcare professionals and other participants cannot be awarded AMA PRA Category 1 CreditTM. However, CME Outfitters will issue a certificate of participation stating that the activity was certified for AMA PRA Category 1 CreditTM. If I'm only planning the activity and not an active faculty member, why do I need to complete a financial disclosure form? The ACCME requires CME providers (i.e. CME Outfitters) to require everyone who is in any position to control the content of an educational activity to disclose all relevant financial relationships with any commercial interest(s) in order to prevent potential bias in the educational content. Is it okay for a pharmaceutical or device sales representative to bring food for our meeting? No. Pharmaceutical and device sales representatives or any representative of medical product/device manufacturers cannon pay directly for food. They can, however, provide an educational grant to your organization in support of the food costs. A signed letter of agreement (LOA) between the company, CME Outfitters, and the non-accredited joint provider must be signed prior to the start of the activity. Can a pharmaceutical or medical device company choose who will speak at our meeting? No. It is up to the activity medical director and planning committee to select appropriate topics and speakers for their CME activity based on the target audience’s educational needs. We received grant support from a pharmaceutical company and a representative would like to attend the meeting, is that allowed? Yes. 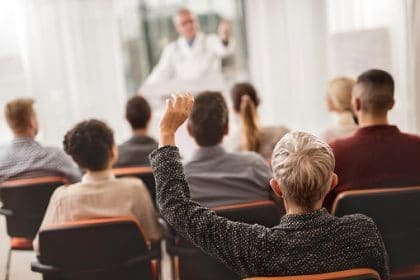 Representatives from pharmaceutical and medical device companies may attend your meeting but may not wear their own name tag or speak to the group in the education space (no post-meeting sales pitch before everyone leaves the room). They should be given the same name badge as attendees are given (if your meeting has name badges). A commercial interest, as defined by the ACCME, is any entity producing, marketing, re-selling, or distributing healthcare goods or services consumed by, or used on, patients. The ACCME does not consider providers of clinical services directly to patients to be commercial interests. A commercial interest is not eligible for ACCME accreditation. What is the difference between exhibits and grants? Exhibit revenue is completely separate from commercial support (grants). Exhibits are never a condition for the recipient of an educational grant (commercial support). Should an exhibit be requested or any other marketing arrangements, a separate agreement must be entered into with the appropriate party from the commercial interest. A fee will be charged for securing exhibit space, and the fee will be consistent for any exhibitor regardless of the organization’s involvement in the provision of an educational grant for the CME/CE activity. Exhibits must be kept separate from the CME activity. Financial, or in-kind, contributions given by a commercial interest, which is used to pay all or part of the costs of a CME activity. The definition of roles and requirements when commercial support is received are outlined in the ACCME Standards for Commercial Support (Element 3.3).